Olimpia Milano’s Facebook Fans, registered on the official FB page (more than 17.000), have chosen the All-Time Starting Line-up for our team, expressing their preference position by position. 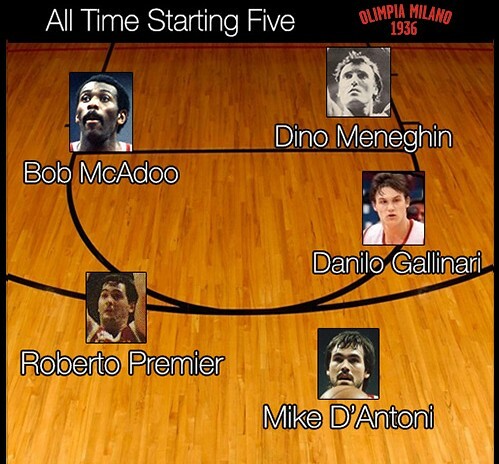 The ideal line-up includes Mike D’Antoni as the point-guard, Roberto Premier at the shooting-guard, Danilo Gallinari at the small forward position, Bob McAdoo playing at the power forward position and finally Dino Meneghin at the center. Non surprisingly is the very same starting line-up for the two European Champions teams in 1987 and 1988 with the only exception of Danilo Gallinari, replacing Kenny Barlow (1987) or Rickey Brown (1988). Our Facebook Fans chose also the second unit, behind the Magnificent Five: Sasha Djordjevic, Antonello Riva, Dejan Bodiroga, Russ Schoene and Joe Barry Carroll.